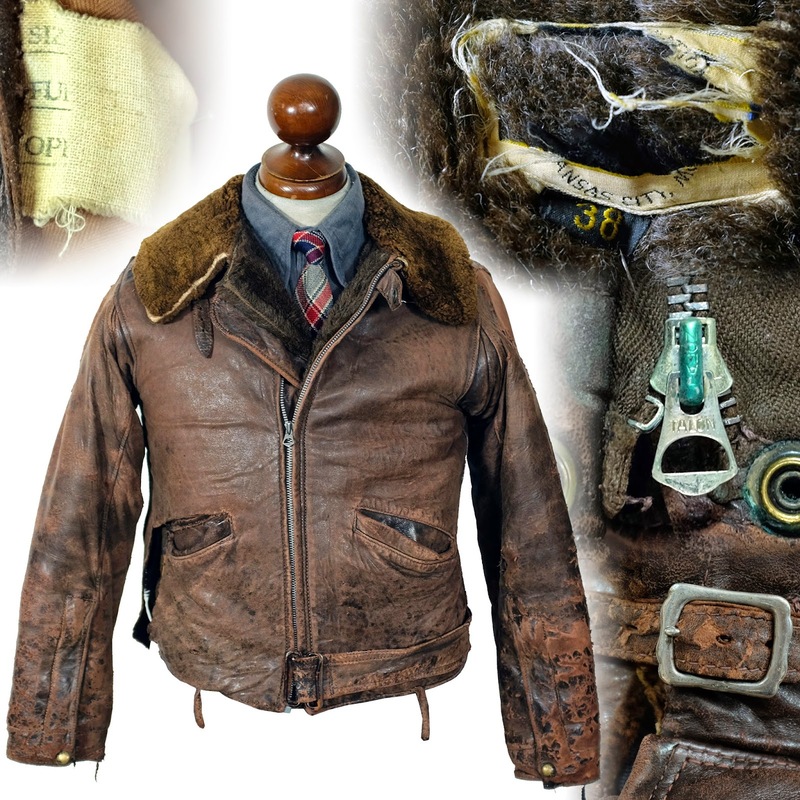 Crown zippers switched over the bulk of their production to military applications early on in the war. Their collaboration with the armed forces for specialized applications led to many breakthroughs in design, which would later be applied to civilian applications. 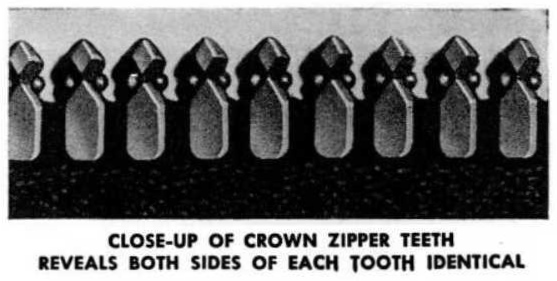 In early 1944, Crown introduced the "two-way" track zipper, which featured symmetrical teeth. 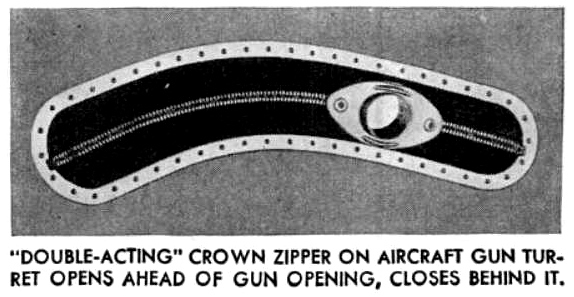 According to crown advertisements of the time, this particular zip was designed for gun turret applications, with a slider affixed to either side of the barrel of the turret's gun. The symmetrical tooth design allowed for smoother action in both directions, and allowed the zip to go around the curve of the turret. 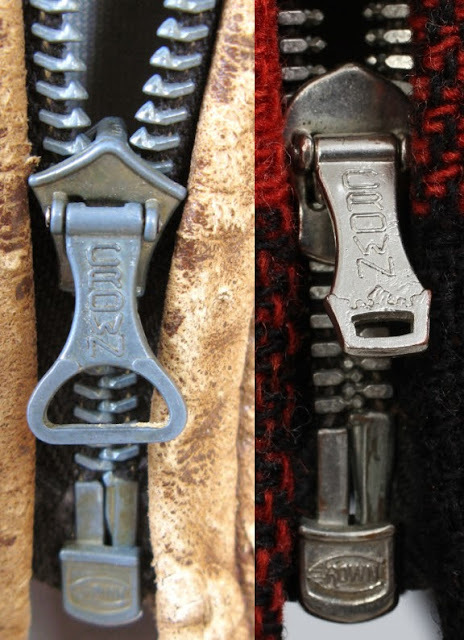 For a photo of one of these zippers in action, see the bottom of the page at this site. The one in that link appears not to be a Crown, however, the same model as the zip on this jacket. One-directional chevron teeth on zipper at left, two directional (symmetrical) teeth on zipper at right. Spring loaded sliders on both. If you run into a zipper with teeth like the one on the right in a civilian application, it was not produced until after the end of WWII. Crown die-cast their teeth directly onto the zipper tape, unlike other manufacturers which clamped the teeth onto the tape. On one hand, it makes for a more durable product and a smoother slide, on the other, it makes replacement necessary if any one tooth goes bad. 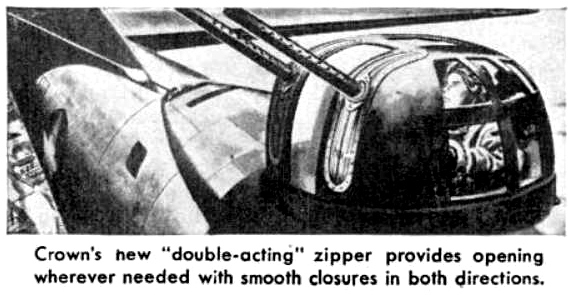 According to ads, the die casting made the production of larger gauge zippers easier. Crown also innovated the use of multiple sliders on the same zipper tape, so that gaps could be made wherever needed. Then, as now, this was most common on sleeping bags and on tent panels. Period ads say as many as 10 sliders were used on a single zipper.